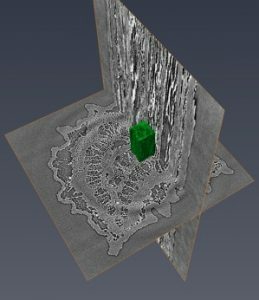 Our goal with this project is to make the high-resolution X-ray micro-computed tomography (microCT) data available for anyone interested in the structure and function of plant vascular systems. As part of our National Science Foundation grant (IOS#1557917*) we are developing a series of representative xylem network models from four hardwood tree species common in the Northeastern United States (Red Oak, White Ash, Red Maple, and American Beech). 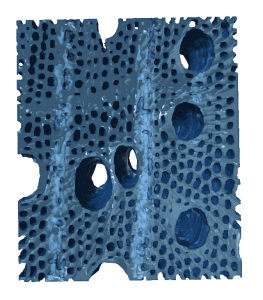 These models will include examples from various tissue types to illustrate how xylem structure changes within the plant leaves, stems, trunks, and roots. This is all part of a larger project to determine how the connections between xylem vessels influence their drought tolerance. 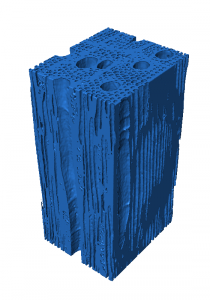 The original microCT data were collected at the Lawrence Berkeley National Laboratory Advanced Light Source (beamline 8.3.2, microct.lbl.gov). Here are four examples of the 3D capabilities available for exploring our models on your computer or mobile phone. Press the “Play” button below, and you’ll be able to manipulate (i.e. rotate, zoom) the sample with your computer mouse (or other pointing device). You can also try clicking the “View in VR” option in the lower right corner of the window after the “Play” button has been pressed. This will bring up a stereoscopic view of the model that can be viewed with a VR headset such as the Oculus Rift or HTC Vive, or even a Google Cardboard headset. The first model is a microCT scan of a Red Maple (Acer rubrum) root, the second is White Pine (Pinus strobus) wood, the third is a piece of a red maple (Quercus rubra) stem wood, and the final sample shows three annual rings from white Ash (Fraxinus americana). Click the little numbers/annotations to see the different anatomical features visible in the models. This database will host representative 3D models that can either be explored through a web browser or downloaded and sent to a 3D printer. Files will be available as .stl (stereolithography) or .form (FormLabs) files, but can be provided in other file formats upon request. Here are two new 3D models from our work with conifer needles. 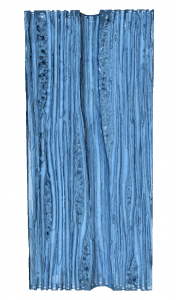 The first model is of a fir needle with the mesophyll exposed in longitudinal section. The second model is of an asterosclerid that was extracted from a Sciadopitys needle. Transverse and longitudinal virtual slices through a microCT scan of a Red Oak petiole, the tissue that connects the leaf blade to the stem. 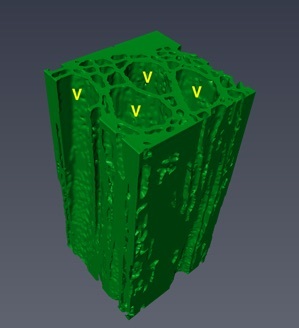 A 3D volume of tissue (green) has been isolated for closer inspection to highlight the spatial organization of the xylem components. Vessels (V) run parallel to each other through this small section, separated by intervessel walls and embedded in a matrix of fibers and parenchyma. diameter of a human hair), but scaled up and printed to approximately 10 cm in length. 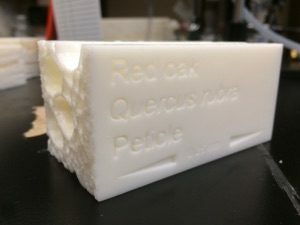 Example 3D prints will be available here within the coming months from four different hardwood species, along with a growing catalog of different species and tissue types from our other research projects.